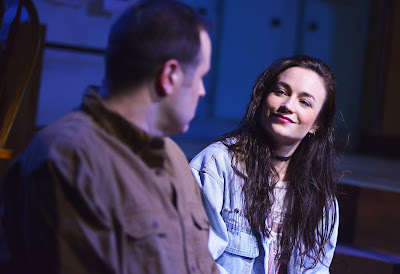 Scott Aiello’s well-intentioned but mawkish Bernie and Mikey’s Trip to the Moon is set in the 1990s, something only gleaned from incidentals like someone wearing a Guns’n’Roses T-shirt. With his dialogue—aside from many F-words—setting and characters harking back to ‘50s sitcoms like Ozzie and Harriet and The Honeymooners, Aiello strings ginned-up crises together, with very little of it explored in any depth. The working-class Vincolo family lives in a suburban Chicago neighborhood. Mike Sr. is a bar owner, wife Gladys a stay-at-home mom, and Mikey the mid-20ish son working in the local fast-food dive while pining for his lovely co-worker Laura, whose boyfriend inconveniently also works there. Then there’s Bernie, Mikey’s early-20ish sister whose near-fatal case of encephalitis as a toddler left her with brain damage, and the fallout is something everyone must deal with. Aiello shows a close family chained to the beloved but difficult Bertie, making their lives progressively more challenging. But he never does much with that interesting dilemma aside from desperate attempts at comedy—Dad’s partner at the bar, Ski, is leaden comic relief, as is the running gag of phone calls from Jeff Goldblum (that’s really the name Aiello chose), an autistic young man who has a crush on Bernie—and near-tragedy, when Bernie disappears from K-Mart. It’s all too neatly, and melodramatically, resolved at the end, and while the old-fashioned writing might steer clear of true bathos, it prevents the play from digging too deeply into these lives. Like the script, Claire Karpen’s straightforward staging relies too heavily on Elvis songs—Bernie loves the singer—which also hampers Forrest Malloy’s otherwise likeable Mikey, who has to do a bad Elvis impression that’s reprised in an overlong diversion when he “speaks” to Bernie through his rolls of stomach flab. Malloy does have a nice rapport with both Ismenia Mendes—who does far more with the underwritten Laura than anyone would have thought possible—and Stephanie Gould (who herself has cerebral palsy), whose Bernie plausibly alternates between stubbornness and docility. Too bad Margo Singaliese (Mom), Jordan Lage (Dad) and Stephen D’Ambrose (Ski) are hampered by the caricatures they’re playing. At least Aiello’s heart is in the right place.